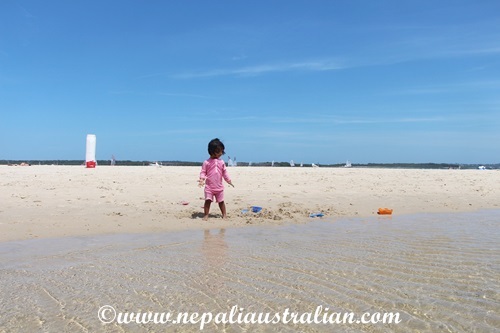 I know most of you on the northern hemisphere are counting the last few days of autumn and it will be a cold winter but for us here down under, it is a different story, its summer time. As you may know reading my posts here that I hate winter so this is a great time of the year for me. I am loving the beautiful spring weather which is slowing turning into summer. To enjoy this beautiful weather we have been going to parks often. 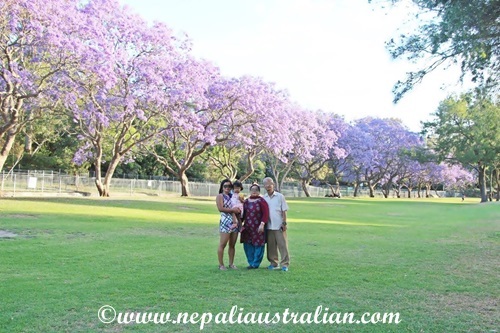 There is a park near our place which has rows of Jacaranda trees and the purple colour looks just amazing this time of the year. 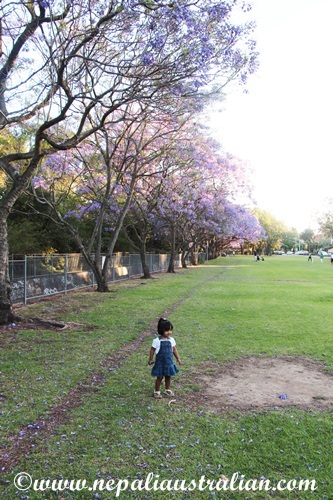 Chhori loves running around and it is a great place for me to spend some time with my parents. 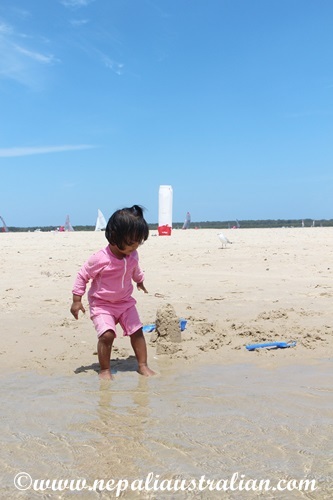 Also on the weekend, we took Chhori to a beach with our friends and family. She had an absolutely amazing time. We took a beach bucket and spade set so we could dig in the sand. 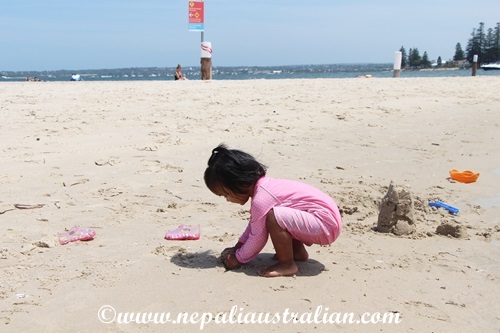 We made sand castles and dug holes. 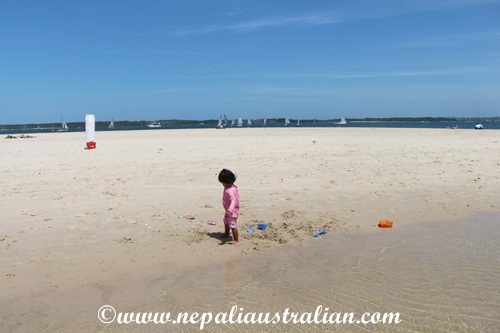 We had Chhori and my nephews covered with sand at one point and they loved it. Overall it was an absolutely great day and I can’t wait to spend more days like this by the beach. Summer always makes me happy, coming home from work when the sun is still up in the sky, enjoying the beach, BBQ and lots of outdoor times. 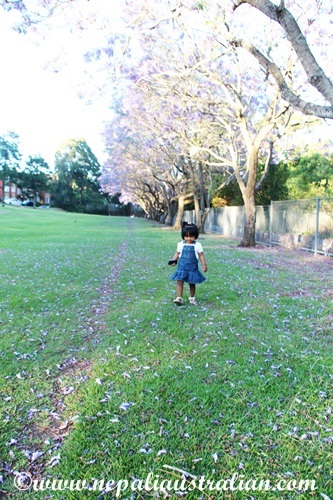 As Chhori is getting older, we are going out and about more and life is getting back to normal. If you are on my side of the world, enjoy the great weather and if you are on the other side, stay warm. On a side note, I am not sure for you all but for me this year has gone by so quickly. I feel as if it was only a few weeks ago that I wrote a post about coming back to work after maternity leave and now it is almost the end of the year. Looking forward to Christmas and New Year break. 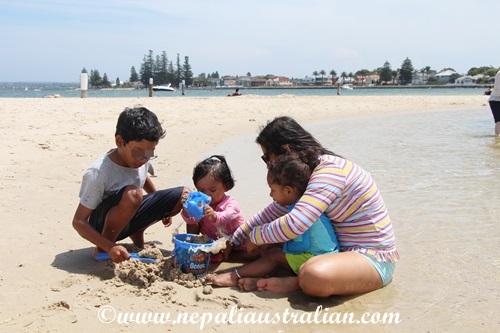 This entry was posted in Australia and tagged Australia, australian, australian nepali, BBQ, beach, chhori, christmas, family, M from nepaliaustralian, Nepal, Nepalese, Nepali, nepali australian, Nepali blog, Nepaliaustralian, parents, park, summer. Bookmark the permalink. I hate the cold too and we’re preparing for what looks like will be a bad winter here in the UK. I sure wish I was in Australia! Australia is not as cold as in UK even in winter. Say warm. 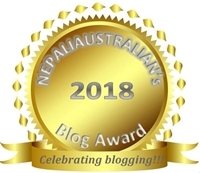 That blog sure makes me green, Australian. This morning we had rain and thunder and I’m wrapped up in warm clothes and have a hot water bottle at night. We have lots of jacarandas in a nearby street and I love to see them in bloom in the spring. I love Spring and Summer so I am in happy state of mind :). Stay warm in the cold weather Dai. 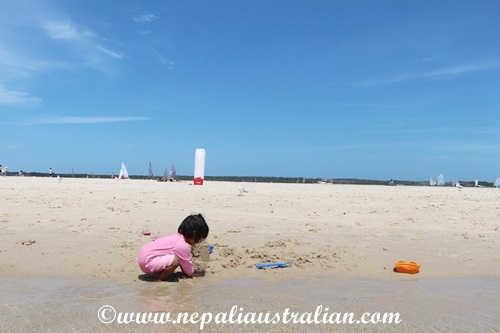 Enjoy the warm days there, nepaliaustralian! The park is beautiful – one of my favorite things about spring is seeing all the colorful flowers too. Lovely.